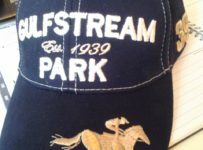 Friday, July 18 –When Wildcat Red and the other horses come onto the track for the $1 million Haskell Invitational, Monmouth Park’s sound system will be blasting out “Born to Run” by New Jersey’s legendary Bruce Springsteen and the E Street Band. “That’s Red. 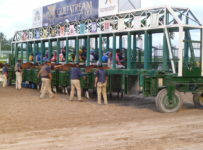 He loves to race and always wants to keep running when he’s out there in the morning,” Wildcat Red’s co-owner Josie Martino Delfino said Friday when told that Springsteen’s breakthrough hit is the signature song for the Haskell (Grade 1) that will be run July 27. 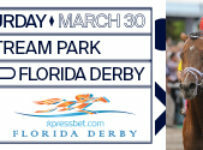 It is the biggest race each year at the track in Oceanport, N,J,–about ten miles north of the clubs in Asbury Park where the saga of “The Boss” and his band began in the 1970s. 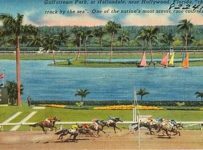 At Gulfstream Park in Hallandale Beach. 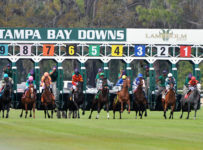 Fla., this year, Wildcat Red won the Hutcheson (Grade 3) and Fountain of Youth (Grade 2) and finished second by a neck to Constitution in the Florida Derby (Grade 1). He will be among the favorites in the Haskell, at 1 1/8 miles for 3-year-olds. She owns Wildcat Red with her husband Salvatore Delfino. They have homes in Venezuela and in the Miami area, and are in the restaurant and wine import-export business. 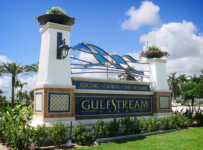 Wildcat Cat left his home track Gulfstream by van on Monday and arrived at Monmouth Park on Tuesday. He is under the care of Nick Galati, the top assistant to trainer Jose Garoffalo who will travel to New Jersey early nest week. Garoffalo plans to have Wildcat Red breeze on the Monmouth track this Sunday. That means speed-favoring. Wildcat Red has raced on or near the lead in almost all of his races–with five wins and three second place finishes in nine starts. 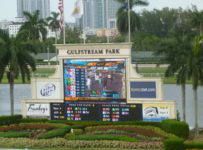 Wildcat Red’s only race away from Gulfstream and only finish lower than second was 18th in the Kentucky Derby on May 3, when he was bumped and squeezed twice during the run to the first turn at Churchill Downs. Wildcat Red suffered a one-inch cut near his right front cannon bone and also came out of the race with bruises on both left legs. 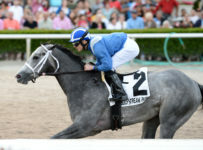 After some rest and an un-rushed return to training, Wildcat Red came back to win the $75,000 Quality Road Stakes at Gulfstream on June 28. He beat East Hall by 10 ¼ lengths and won the 1 1/16 mile race in the fast time of 1:42.70 while being ridden out by Luis Saez. 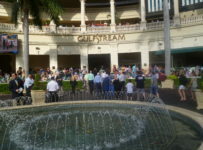 The Delfinos had several dozen friends and family members with them in the winner’s circle after the Quality Road–similar to the gatherings for Wildcat Red’s other Gulfstream races. They will have a cheering section, although smaller, with several family members for Wildcat Red at the Haskell. Saez will again have the mount. 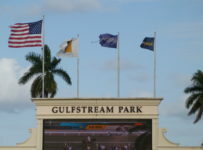 The Delfinos go to Gulfstream to see Wildcat Red most mornings when they are in Florida. They talk by phone with Garoffalo, a native of Venezuela, on other days. Wildcat Red is a son of D’wildcat, a multiple sprint stakes winner. His mother Racene has a distance-heavy pedigree. Wildcat Red is one of the five horses the Delfinos own for their Honors Stable Corp. It is named for Trippi Honor, their first horse who won four races while trained by Garoffalo. Now a 6-year-old, she is in Ocala where she will become a broodmare. 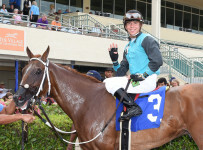 The Delfinos’ three other horses are in training with Garoffalo at Gulfstream. Capriccio Blue is a 4-year-old filly. Lucky Delfino and Black Martino are 2-year-old colts that Garoffalo is preparing for their first starts. 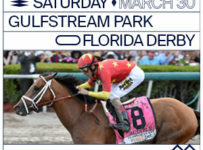 The Haskell will be the first match-up of Wildcat Red and Social Inclusion, another Gulfstream-stabled star owned and trained by native Venezuelans. 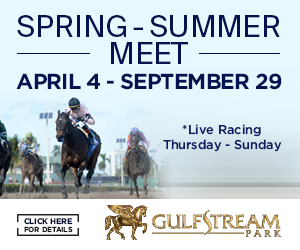 Social Inclusion set a Gulfstream track record of 1:40.97 for 1 1/16 miles when he won an allowance on March 12. He later finished third in the Preakness Stakes. Ron Sanchez and his Rontos Racing Stable own Social Inclusion, who is trained by Manny Azpurua. The Haskell will attract national attention partly because of the filly Untapable, the winner of this year’s Kentucky Oaks (Grade 1). Bayern, Medal Count, Albano and Just Call Kenny also are likely entrants in a field that could be as large as ten horses. Bayern, Albano and Social Inclusion also have early speed. 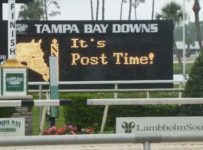 Post positions will be among factors for Garoffalo to decide whether Saez should seek the early lead or keep Wildcat Red several lengths off it. 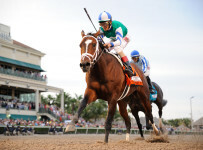 The Travers (Grade 1) at 1 ¼ miles at Saratoga Race Course on Aug. 23 is the likely next race for Wildcat Red and other horses if they turn in good showings in the Haskell.